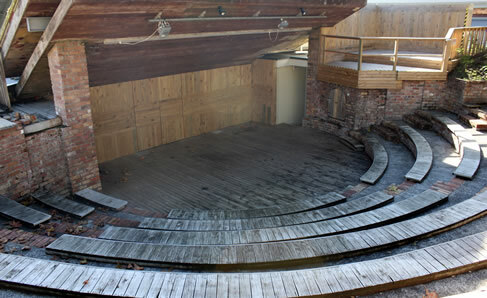 The picturesque amphitheatre is a spectacular outdoor venue. Be it Shakespeare, music or something else, your audience will remember the atmosphere as the sun sets over the lake and the stars come out above. Set in the heart of the North Shore, the wonderfully unpredictable nature of outdoor theatre makes each visit here extraordinary and thrilling. The amphitheatre seats a maximum of 192 patrons in general admission ticketing on bench seats. There are also two stage balconies either side of the main stage. There are accessible pathways to the amphitheatre and a lighting desk at the back of the seating area. To find out more or to schedule a site visit, please contact Business Manager James Bell by emailing james@pumphouse.co.nz or phone 09 486 2386. Charges and hire rates. Please speak to us about a firm quote. Fill out this form if you’re interested in hiring the Genevieve Becroft Auditorium. We’ll come back to you with a quote and availability.